Packed with adolescents� own personal accounts and perspectives, this accessible overview will be essential reading for teachers, social workers and mental health professionals. Meeting a crucial need, this book distills the best current knowledge on child and adolescent suicide prevention into comprehensive guidelines for school-based practitioners. The author draws on extensive research and clinical experience to provide best-practice recommendations for developing schoolwide prevention programs, conducting risk assessments, and intervening at different levels of intensity with students at risk. Also presented are postvention procedures for responding effectively if a suicide does occur. Legal and ethical issues are addressed in detail. Reproducible handouts include sample assessment questions for students, teachers, and parents; the book's large-size format and lay-flat binding facilitate photocopying. A seminal work on treating self-mutilation, revised and updated with illuminating case studies and newly available drugs and resources. Nearly a decade ago, "Cutting" boldly addressed a traumatic psychological disorder affecting as many as two million Americans. More than that, it revealed self-mutilation as a comprehendible, treatable disorder, no longer to be evaded by the public and neglected by professionals. Using copious examples from his practice, Steven Levenkron traces the factors that predispose a personality to self-mutilation: genetics, family experience, childhood trauma, and parental behavior. Written for sufferers, parents, friends, and therapists, "Cutting" explains why the disorder manifests in self-harming behaviors and describes how patients can be helped. Discusses risk factors for self-harm, including depression, substance abuse and antisocial behaviour, and critically examine key screening instruments that can be used to assess risk. Describes how suicidal behaviour can be managed and prevented, and looks at the effectiveness of aftercare treatment for those who self-harm, including school-based suicide-prevention programs and family therapy. Also addressed are common myths about self-harm and the problem of varying definitions in this field. Deliberate Self-Harm in Adolescence clearly summarizes and evaluates current research into suicidal behaviour - it is essential reading for social workers, mental health professionals, GPs, teachers and parents. This highly practical book adapts the proven techniques of dialectical behavior therapy (DBT) to treatment of multi-problem adolescents at highest risk for suicidal behavior and self-injury. The authors are master clinicians who take the reader step by step through understanding and assessing severe emotional dysregulation in teens and implementing individual, family, and group-based interventions. Tens of thousands of worried parents have turned to this authoritative guide for the facts about the growing problem of teen self-injury--and what they can do to make it stop. Michael Hollander is a leading expert on the most effective treatment approach for cutting, dialectical behavior therapy (DBT). Vivid stories illustrate how out-of-control emotions lead some teens to hurt themselves, how DBT can help, and what other approaches can be beneficial. Parents get practical strategies for talking to teens about self-injury without making it worse, teaching them specific skills to cope with extreme emotions in a healthier way, finding the right therapist, and managing family stress. Incorporating the latest research, the revised edition offers a deeper understanding of the causes of self-injury and includes new DBT skills. This book provides information and guidance for professionals on understanding self-harm and responding appropriately. Uses an easy-to-read, jargon free and positive approach to tackle the stigma attached to self-harm and suicidal behaviour. This book combines case studies with professional advice to help the reader take the first steps towards helping the young person in need. It advises on how to distinguish between normal adolescent behaviour and the signs of mental health problems, while showing how an adult can sensitively communicate with a teenager about the difficult subject. The book also emphasizes the importance of parents and carers seeking support for themselves. The authors describe the nuts and bolts of assessing adolescent clients and crafting individualized treatment plans that combine cognitive and behavioral techniques, emotion regulation interventions, family involvement, and antidepressant medication. Synthesises traditional (behavioural) and newer (psychological) approaches to understanding self-injury, drawing on psychoanalytic and social theory to provide practical guidelines for more sustained and effective support. 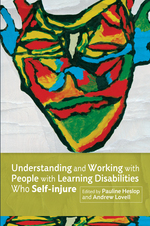 It suggests that motivations for self-injury may be similar for people with and without learning disabilities, and draws on case work examples to suggest person-centred techniques that encourage communication � particularly important with people who do not use verbal communication - and recovery. The book covers a range of specific needs, including people with autism who self-injure, and emphasises the views of people with learning disabilities themselves and their families about what has worked best, and why. At the end of each chapter, a variety of practical implications for the provision of support are given. Provides a comprehensive, highly practical approach to working with this challenging group of clients. This book offers readers effective guidelines for how parents can prevent and constructively manage self-harming episodes, discusses the major aggravating factors that contribute to the development and maintenance of this problem among youth, and offers an integrative and flexible solution-oriented approach for treatment. Another important feature of this book is the innovative, skill-based Stress-Busters Leadership Group, which can be run in schools or any treatment setting. Begins by covering the theory behind suicidal behaviour, using Transactional Analysis to explore the personality types of suicidal individuals and to understand their motivations. Factors that contribute to an individual becoming suicidal, such as mental illness, are also explored. A comprehensive system for the assessment of suicide risk is provided, including both quantitative and qualitative approaches. Finally, the author discusses different ways suicidal and pseudo-suicidal individuals can be managed and treated, including the 'no suicide contract' and redecision therapy. Case studies are included throughout to demonstrate the theory and practice. This book will be essential reading for all those working with a suicidal or at-risk individual, including practitioners in health, social work, psychotherapy, psychology and counselling.